If family values are important and you enjoy spending time outdoors year round, you'll fit right into the Warsaw Indiana real estate market. Recognized as the Kosciusko county seat and home to fewer than 15,000 residents as of the last census, this is one place where you can buy a home today and expect it to retain its value even if the economy takes a dip. 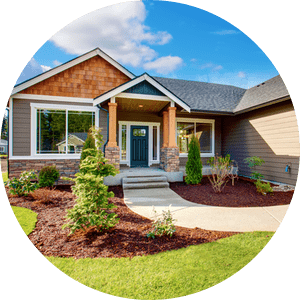 When you start searching Warsaw Indiana homes for sale it’s important to select Warsaw Indiana Realtors with superior knowledge of the local market. This is exactly why so many consumers choose The Julie Hall Group to help facilitate their real estate transactions. While the Warsaw Indiana real estate market often features higher home prices than you will find in some surrounding communities, the city also offers a family-friendly community with almost endless opportunities for outdoor recreation. Many adjacent communities depend on Warsaw's thriving economy and diverse range of entertainment options, but living in the city gives you direct access to the jobs, the entertainment and four of the region's best lakes. You can also take advantage of Kosciusko Community Hospital, Warsaw Municipal Airport, Ivy Tech Warsaw Campus and Indiana Tech Warsaw Campus. As the Orthopedic Capital of the World, Warsaw naturally attracts medical professionals. Some of the major employers include Zimmer/Biomet, DePuy Synthes, Medtronic, Tecomet, Paragon Medical and Instru-Med. Warsaw's bustling economy represents many other industries as well, including the commercial printing industry with RR Donnelley. Da-Lite Projection Screens delivers products to educational facilities and corporations around the world while Maple Leaf Farms is a multinational distributor of raw and cooked duck products. For residents in the financial industry, Lake City Bank is a major employer. Forbes named Warsaw one of the top 12 best cities to raise a family, and it definitely lives up to that designation. Children are well educated in Warsaw Community Schools, and families enjoy comfortable living environments in communities like Barrington Hills. Located in the northern tip of the city, this mixed subdivision offers beautiful homes, a community pool and a short drive to the airport. If you prefer the small town feel of the countryside, head just outside the city to The Dells. With wide tree-lined streets and annual community events like the Easter egg hunt, this is the perfect place to slow down and build memories with loved ones. Other popular neighborhoods that often have Warsaw, IN homes for sale include Deed's Creek, The Meadows, Pheasant Ridge, Shadow Lakes and Summer Field Estates. One of the biggest Warsaw Indiana real estate attractions is its bustling economy with many opportunities for employment, but the city's secrets are its calm, serene hideaways. The historic downtown area is home to many small shops and a variety of restaurants. The First Friday event celebrates the city's small businesses while bringing residents together for a little fun. Residents can take improv and acting classes or enjoy an entertaining show at the Wagon Wheel Center for Performing Arts. The City-County Athletic Complex, or CCAC, offers sports leagues for all ages in volleyball, baseball and soccer. Families benefit from the newly built YMCA, and children are enriched through the Kosciusko County 4-H program. For outdoor recreation, residents head out to the Warsaw-Winona Lake Greenway Trail or enjoy a number of trails included in the city's Ride+Walk program. This network of trails offers miles of paved biking, walking and running trails throughout the city as well as nearby communities. Whether you're a serious athlete, a weekend warrior or a parent interested in wholesome family fun, there's always a safe place to stretch your legs and enjoy the fresh air. Of course, you can't talk about Warsaw without mentioning the four surrounding lakes that define outdoor enjoyment. Pike Lake and Center Lake are located near the center of the city and offer opportunities for swimming, boating, camping and picnicking. Hidden Lake is a smaller body of water tucked in the northern region of the city, and Winona Lake nestles up to the southeastern corner. If you're searching for a lakeside home that accommodates your love of boats, you have many great options with Warsaw Indiana real estate. Whether you're moving a few miles across Warsaw or relocating to northern Indiana from another state, The Julie Hall Group is your answer to navigating the greater Warsaw Indiana real estate market. 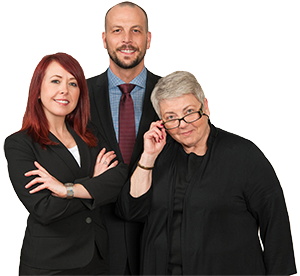 Our group is made up of four expert Warsaw Indiana Realtors (Julie Hall, Jason Patton, Judy Brown, and Ashley Black) with over 35 years of combined experience. Each member is passionate about helping good people find great homes in Kosciusko and the surrounding counties. Over the past 5 years The Julie Hall Group assisted over 600 customers with the sale or purchase of their residential, commercial and investment properties in and around Kosciusko County. This resulted in sales volume totaling more than $38 million. We even have OUR OWN MOVING TRUCK which we provide to our clients FREE OF CHARGE whenever possible. * This is our way of saying “thank you” while allowing our customers to save time and money during an exciting, yet stressful, moment in their lives. Our clients are able to sit back and relax because they have the area's leading Warsaw Indiana real estate experts by their side. 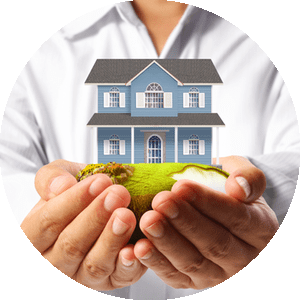 When the time is right for you to buy or sell property in Kosciusko, Elkhart, Fulton, Marshall or Whitley County, we are here to help you make the most of the current greater Kosciusko County real estate market. We understand the process of hiring a REALTOR can seem like an overwhelming task at times. But as we stated before, expertise and local market knowledge should be near the top of the selection criteria when making your final decision. Take a look at the map below detailing just a few of our most recent Warsaw Indiana Homes sales. As you can see, we sell A LOT of homes in Warsaw and we know this market better than anyone else. We built this website with one specific purpose in mind. 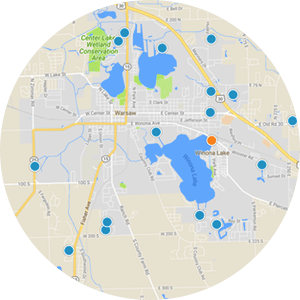 We set out to provide the general public with the most powerful and accurate greater Warsaw Indiana real estate resource ever created, and that's exactly what we did. Our group pays for a direct data feed from the Indiana Regional MLS. This is the same database used by all Northern Indiana Realtors. We then pass this information directly onto the consumer. All information on this website is updated every 5 minutes. Use our ADVANCED SEARCH tool to narrow your search by school system, subdivision, MLS#, or zip code. Use our PROPERTY VALUE TOOL to instantly find the value of your Northern Indiana home. We also provide customers with SOLD DATA and completely customizable MARKET REPORTS to help you monitor market conditions. CONTACT US with questions or requests today because your ideal property could hit the market tomorrow! We would love the opportunity to call ourselves your preferred Warsaw Indiana Realtors.